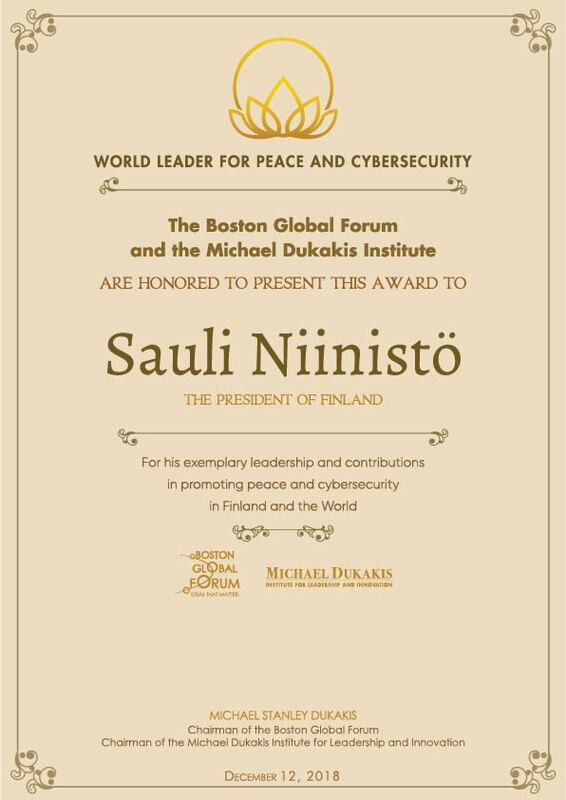 President Sauli Niinistö – President of the Republic of Finland received the World Leader for Peace and Cybersecurity Award from the Boston Global Forum (BGF) and the Michael Dukakis Institute for Leadership and Innovation (MDI). He was honored during Global Cybersecurity Day, which is observed on December 12 each year. The goal of Global Cybersecurity Day is to inspire the shared responsibility of the world’s citizens to protect the Internet’s safety and transparency. This year’s conference revolved around the theme “AI solutions solve disinformation“. During the discussion, experts explored the current state of cybersecurity and the threat posed by disinformation, anonymous sources and fake news as well as the role AI can play as an effective defense mechanism against these threats to truth and the principles of democracy. Former Massachusetts Governor Michael Dukakis, Chairman and Co-founder of BGF & MDI, moderated this year’s event. President Niinistö was presented with the World Leader for Peace and Cybersecurity Award for his leadership role in establishing Finland as a vital member of the world community and his support of The European Centre of Excellence for Countering Hybrid Threats. In this role, he has fostered the understanding of, and solutions to the numerous threats we face from political forces, economic instability, military intervention, civil unrest, climate change, and unsafe Internet practices. In a video message presented at the Global Cybersecurity Day Symposium, President Niinistö expressed his honor to receive this award and emphasized the importance of cooperation between nations to tackle the issues related to ongoing cyberthreats. “To increase national cybersecurity, all nations need to do their upmost to increase awareness among their citizens in all sectors of society. In cyberspace, we need to strengthen our cooperation between nations and rules over international borders,” said President Niinistö. To guarantee the interoperability among different frameworks and approaches of governments, given the conditions of uncertainty and complexity in the AI ecosystem, Boston Global Forum – Michael Dukakis Institute for Leadership and Innovation (BGF-MDI) published AIWS Report on AI Ethics and proposed the model for Government AIWS Ethics and Practices Index. Also, BGF-MDI cooperated with AI World to form a strategic alliance host of the AI World Government Conference & Expo, on June 24 to 26, 2019, Washington, D.C.